The White House has dismissed claims George Bush was talked out of bombing Arab television station al-Jazeera by UK Prime Minister Tony Blair. The allegations were made by an unnamed source in the Daily Mirror newspaper. Ex-UK minister Peter Kilfoyle, who opposed the Iraq war, had called for a transcript of the alleged conversation to be published. 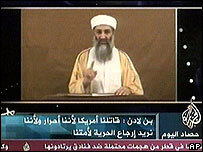 Launched in 1996, al-Jazeera is best known outside of the Arab world for carrying exclusive al-Qaeda messages. The station is based in Qatar, a close ally of Washington's and the location of US military headquarters during the Iraq war. According to the Mirror's source, the transcript records a conversation during Mr Blair's visit to the White House on 16 April 2004, in the wake of an attempt to root out insurgents in the Iraqi city of Falluja, in which 30 US Marines died. The memo, which the Mirror says is stamped "Top Secret", allegedly details how Mr Blair argued against what the paper calls a "plot" to attack the station's buildings in the business district of Doha, the capital city of Qatar. A Downing Street spokesman said: "We have got nothing to say about this story. We don't comment on leaked documents." But Mr Kilfoyle - a former defence minister and leading Labour opponent of the Iraq war - has called for the full text to be published. "I believe that Downing Street ought to publish this memo in the interests of transparency, given that much of the detail appears to be in the public domain. "I think they ought to clarify what exactly happened on this occasion. Mr Kilfoyle said he had not seen the memo, but had learnt of its alleged contents at the time of the original leak and believed it tallied with the Mirror's report. In a statement, al-Jazeera said it needed to be sure of the report's authenticity before reaching any conclusions and urged Downing Street to confirm its status as soon as possible. The statement said: "If the report is correct, then this would be both shocking and worrisome not only to al-Jazeera but to media organisations across the world. "It would cast serious doubts in regard to the US administration's version of previous incidents involving al-Jazeera's journalists and offices." Liberal Democrat foreign affairs spokesman Sir Menzies Campbell said: "If true, then this underlines the desperation of the Bush administration as events in Iraq began to spiral out of control. "On this occasion, the prime minister may have been successful in averting political disaster, but it shows how dangerous his relationship with President Bush has been." BBC News website world affairs correspondent Paul Reynolds said: "An attack on al-Jazeera would also have been an attack on Qatar, where the US military has its Middle East headquarters. So the possibility has to be considered that Mr Bush was in fact making some kind of joke and that this was not a serious proposition." According to The Mirror, the transcript is the document which allegedly turned up in the constituency office of former Labour MP Tony Clarke in May 2004. Mr Clarke - who voted against the Iraq War and lost his Northampton South seat in this May's election - said he returned the document to the government because of fears British troops' lives could be put at risk if it became public. Cabinet Office civil servant David Keogh has been charged under the Official Secrets Act of passing it to Mr Clarke's former researcher Leo O'Connor. Both men are bailed to appear at Bow Street Magistrates Court next week. Mr Clarke refused to discuss the contents of the document which he received, telling the Press Association his priority was supporting Mr O'Connor, who he said did "exactly the right thing" in bringing it to his attention.